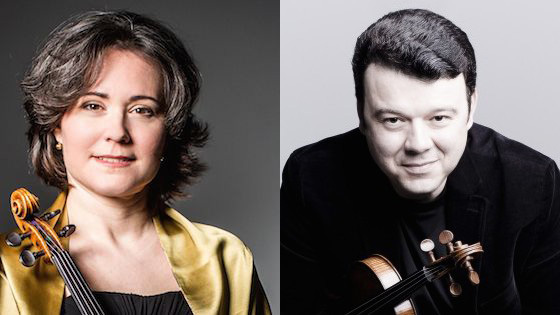 March 15, 2018, 9:58 AM · Violinists Judith Ingolfsson and Vadim Gluzman will each join the violin faculty at the Peabody Institute in Baltimore starting this fall, the school said in two separate announcements. Judith Ingolfsson and Vadim Gluzman. Ingolfsson and her duo partner pianist Vladimir Stoupel will visit campus several times as Guest Artists in the 2018-19 academic year, and Ingolfsson will begin studio teaching at Peabody in the fall 2019 semester, Peabody announced Wednesday. Gluzman will join as Distinguished Artist in Residence beginning in 2018-19, teaching a private studio of Conservatory violin majors, coach ensembles, and present public master classes, Peabody announced in February. Born in the Soviet Union in what is now Ukraine, Gluzman studied in Russia with Zakhar Bron before moving at age 16 to Israel. There he met Isaac Stern, who became an influential friend and mentor. Gluzman went on to study in the United States with Arkady Fomin and at Juilliard with Dorothy DeLay and Masao Kawasaki. In 1994 he received the Henryk Szeryng Foundation Career Award. He has made numerous recordings for BIS and keeps a full schedule of performances with major orchestras. "For me, teaching is an essential part of the artist’s life, and I am very much looking forward to sharing my experiences with students and to working together with wonderful colleagues at this world-class conservatory," Gluzman said. "I am extremely pleased and excited to be joining the Peabody Institute." Based in Berlin, Ingolfsson performs regularly with https://www.ingolfsson-stoupel-duo.com/about-the-duo, founded in 2006, which last month released a recording of Sonatas by Poulenc, Ferroud, and Ravel. Ingolfsson studied at the Curtis Institute and at the Cleveland Institute of Music with Jascha Brodsky, David Cerone, and Donald Weilerstein. She won the Gold Medal at the International Violin Competition of Indianapolis in 1998 and was a prizewinner at the Premio Paganini Competition in Genoa and at the Concert Artists Guild Competition in New York. She is currently Professor of Violin at the State University of Music and Performing Arts Stuttgart and co-artistic director and founder of the Festival "Aigues-Vives en Musiques" in France.